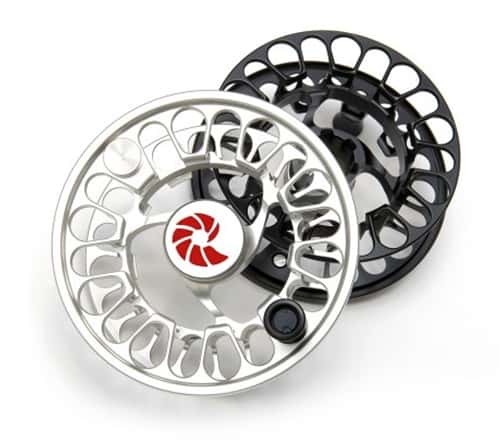 Product description: Nautilus NV fly reels are available in five sizes and 10 configurations, and are unparalleled in weight, good looks and performance. The Nautilus NV 5/6, 6/7, 8/9, 10/11 and 11/12 and their G-Spool siblings are completely impervious to the elements and will outperform any fighting class reel on the market. The Nautilus NV series feature a larger version of the CCF drag system compared to their Nautilus CCF siblings, and stainless steel components have largely been replaced by ceramics and titanium. The only aspect in which the reel is exceeded in performance is by its slender looks and subtle beauty. Machined entirely out of aircraft grade Aluminum, no details have been omitted: from its low profile drag knob and counterweight to the 100 and 200 yard backing markers on the inside of the spool. These reels will impress you. All NV reels feature titanium drag shafts, and are loaded with the latest technology in high performance ceramic micro bearings. Since ceramics and titanium are impervious to the elements, you are guaranteed to spend less time worrying and more time fishing. NV reels feature a “thrust bearing to thrust bearing” drag design for effortless cranking resistance under any load, ensuring the smoothest line retrieval of any reel on the market. Using titanium and ceramics has allowed us to downsize components, increase the drag surface by over 75%, and still decrease the overall weight without sacrificing the fighting class qualities that are the hallmark of our products. The Nautilus NV fly reel series are the lightest reels in their class, and offer the greatest value in any big game fly reel available in the market today. A reel of a lifetime for a lifetime of fish. They are without a doubt, the best reels money can buy. The NV Spey 400-550 will fit your existing NV 10/11 frame and the NV Spey 450-750 fits the NV 11/12 frame. NV 8/9 WF-8 +200 yds #30 7.1 0z. NV 10/11 WF-11 +225 yds #30 7.6 0z. NV 11/12 WF-12 +325 yds #30 9.6 0z. NV-G5/6 WF-5 +150 yds #20 5.1 0z. NV-G6/7 WF-6 +175 yds #20 5.7 0z. NV-G7 WF-7 +200 yds #30 6.6 0z. NV-G8 WF-8 +200 yds #30 7.2 0z. NV-G9 WF-9 +225 yds #30 8.3 0z. NV-G10 WF-10 +225 yds #30 9.9 0z. NV Sx 400-550 400-550 grain heads or 7/8/9 spey lines 150 yds .030" 8.1 0z. NV Sx 450-750 450-750 grain heads or 9/10/11 spey lines 150 yds .030" 9.1 0z.